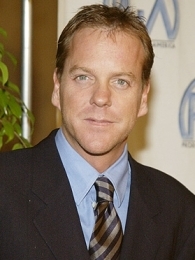 Kiefer Sutherland (born December 21, 1966) in London, England, UK to parents 'Donald Sutherland' and 'Shirley Douglas'. He got his first film role in the movie Max Dugan Returns (1983). Sutherland's first major role was in the Canadian drama, The Bay Boy (1984), which earned Sutherland and director 'Daniel Petrie', Genie award nominations for best actor and best director, respectively. Following his success in The Bay Boy, Sutherland eventually moved to Los Angeles and landed television appearances in The Mission, an episode of Amazing Stories (1985) and in the telefilm Trapped in Silence (1986) with 'Marsha Mason'. 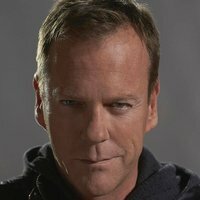 In 1992, Sutherland starred opposite 'Ray Liotta' and 'Forest Whitaker' in Article 99 (1992) and in the military drama A Few Good Men (1992) also starring 'Jack Nicholson' and 'Tom Cruise'. Later, in 1994, he starred with 'Jeff Bridges' and 'Nancy Travis' in the American version of The Vanishing (1993) for Twentieth Century Fox. In 1997, he co-starred with 'William Hurt' and 'Rufus Sewell' in Dark City (1998), directed by 'Alex Proyas', which was a special presentation at the Cannes Film Festival. Sutherland also added his second directorial credit and starred in Truth or Consequences, N.M. (1997) alongside 'Kevin Pollak', 'Mykelti Williamson', 'Rod Steiger' and 'Martin Sheen'. 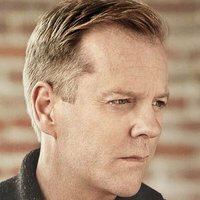 He currently stars in the Fox drama 24 (2001) as Jack Bauer for which he has earned a Golden Globe for Best Actor in a Drama Series. Most recently he has been seen in the movie Phone Booth (2002) as a man who calls up someone at a phone booth and threatens to kill them if they hang up. Appears in one scene of _Article 99 (1992)_ (qv) wearing glasses and a fishing bucket hat, a tip to father 'Donald Sutherland (I)' (qv), who sported the same look in _MASH (1970)_ (qv). Named after Warren Kiefer, pen name of 'Lorenzo Sabatini' (qv). Sabatini directed _Il castello dei morti vivi (1964)_ (qv) [aka Castle of the Living Dead (1964)], in which 'Donald Sutherland (I)' (qv) made his theatrical film debut. He attended seven different schools in ten years. Traveled with the rodeo circuit in the late 1990s and won rodeos in Phoenix and Albuquerque. His stepdaughter Michelle Kath is expecting her first child in February 2005. 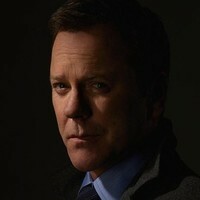 His role as Jack Bauer in _"24" (2001)_ (qv) is his first regular role on a television series. Shares birthday with _The Three Musketeers (1993)_ (qv) co-star 'Julie Delpy' (qv).